An awareness campaign for Conservation International (CI) to encourage millennials to take action in the fight against water scarcity. The online hub employs a range of features to engage, inform and motivate this younger generation to make small changes in their individual behavior. Collectively, these change will reduce the threat of water scarcity. My group began by developing the image of CI as an environmental organization through online research and an analysis of their visual brand. CI engages many environmental matters; however, we were alarmed by CI's statistics on water. By 2015, 1 in 4 people will face water scarcity in the United States. My group decided this situation needed to be addressed with action. Water scarcity is defined as the lack of avaliable water resources to meet the demand of water usage within a region. Our problem: educate millennials on the issue and impel them to join CI's initiative to create change. Our research revealed that water scarcity is a grave issue; less than 3% of the water on Earth is fresh. Due to the misconception that freshwater is readily available, people are not managing this resource efficiently. 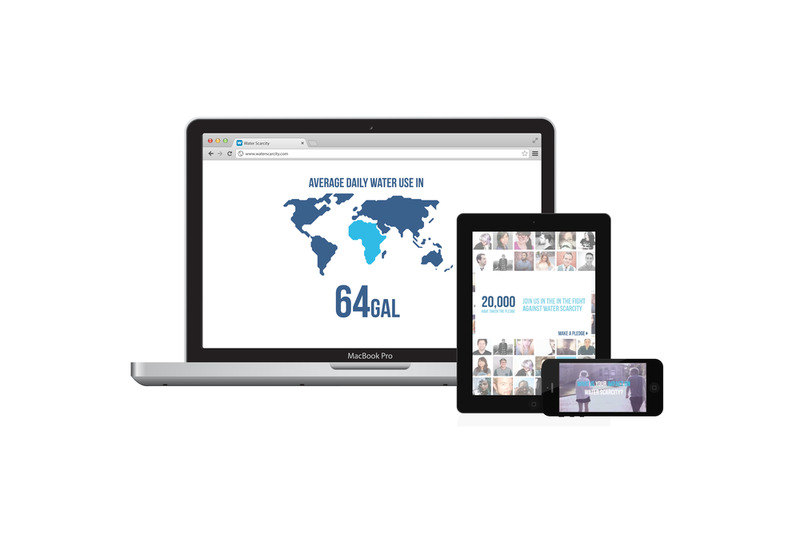 We focused our campaign around the idea that small changes among individuals can collectively create a large impact in the fight against water scarcity. This tactic directly targets our millennial audience, as instant gratification and user-generated content dominate their media consumption.